"Americans throwing Cargoes of the Tea Ships into the River, at Boston," engraving by W. D. Cooper in The History of North America, London, 1789. This week’s selection gathers three documents that offer Adams’s impressions of what is probably the most famous event of the entire Revolution. In late November 1773, having relocated from Braintree the previous year, Adams and his family were living in Boston when the Dartmouth, a three-masted trader, arrived in Boston Harbor with its valuable cargo of tea. Earlier that year, Parliament had granted the faltering East India Company a monopoly on the importation of tea to America. 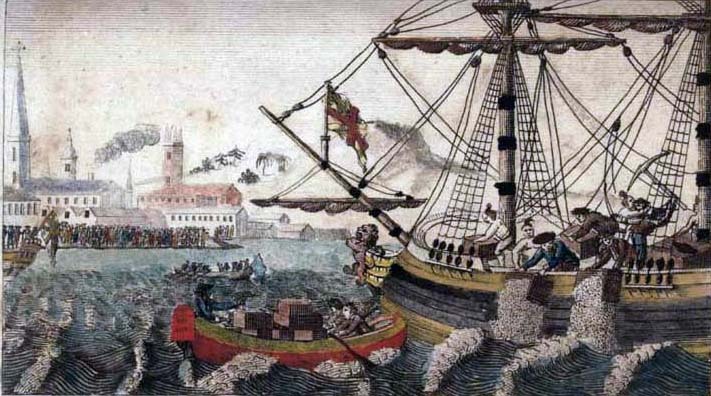 By allowing the Company to sell directly to the colonies, the Tea Act would ostensibly mean lower prices on legally imported tea, but it was a dagger to Boston merchants (and especially to the thriving black market), and many political leaders objected to the act as a usurpation of power by Parliament. With the ship in the harbor, John’s wife, Abigail, wrote to a friend, “that bainfull weed is arrived. Great and I hope Effectual opposition has been made to the landing of it.” Many Boston residents believed that Governor Thomas Hutchinson might have defused the crisis (as did other royal governors) had he just allowed the ship to return to England without unloading its cargo. Instead, Hutchinson insisted the tea be unloaded and the duties paid. Every American schoolchild knows what happened next. After a raucous meeting of five thousand citizens at Old South Church on December 16, a group of men disguised themselves as Indians and boarded the ship. In a few minutes, “they had demolished 342 chests of tea worth about ten thousand pounds, today’s equivalent of about $1 million,” summarizes John Ferling is his biography of Adams. Word of the daring act spread within weeks throughout the colonies and across the Atlantic—although the event wouldn’t be widely referred to as the Boston Tea Party for several decades. The following morning John Adams returned to Boston from a trip to Plymouth and immediately heard what had happened. The first two sections that follow are a diary entry and a letter to a friend that record Adams’s initial reactions that first day after the “Destruction of the Tea”; although he was in principle opposed to mob action, he seems defiantly exuberant that the break with the British had finally come. Similar protests took place in other colonial cities, but during the following months the British prime minister, Lord North, rushed through Parliament various punitive measures directed specifically against Massachusetts. The third section is John’s letter to Abigail in May, just after the colonists received word of the Boston Port Act, which closed the port to all trade effective June 1, 1774, virtually strangling the town from global commerce. Together, these three texts from the Adams Papers chronicle the immediate impressions of the events that would spur John Adams to become a leading figure in the War of Independence. Notes: There are scattered references to various friends of Adams and to leading citizens of Boston; readers seeking more information on them will find much material in online references such as Wikipedia. In particular, Mr. Trumble (p. 287) refers to John Trumbull, Adams’s law clerk and later a prominent poet; Cushing, Pemberton, and Swift (p. 288) are Thomas Cushing, Samuel Pemberton, and Samuel Swift, a radical leader and lawyer; Coll Doane (p. 288) is Col. Elisha Doane, a wealthy client of Adams; and Balch (p. 288) is Nathaniel Balch, a local resident widely known for his wit. Last Night 3 Cargoes of Bohea Tea were emptied into the Sea. This Morning a Man of War sails. This is the most magnificent Movement of all. There is a Dignity, a Majesty, a Sublimity, in this last Effort of the Patriots, that I greatly admire. . . . If you don't see the full story below, click here (PDF) or click here (Google Docs) to read it—free! No civilized society without serious taxation of the wealthy. No civilized society without an equal right to quality education, healthcare, housing and bargaining rights. No civilized society as long as the pathetically misinformed and xenophobic white folks who call themselves Tea Partiers think such humane fairness is suspect. The spirit of America is embodied in those original tea partier's as it is in this century. God bless them, this country and Sarah Palin. Elites may look down their noses at the Tea Party and define and demand a "Civilized Society". But that society, so defined, has ceased to be free. I would not call our Founding Fathers, who would not recognize this society, misinformed. Nor those who are trying to reclaim that liberty they bestowed upon us. Let us look to are own wallets, not those of our neighbors, when it comes to helping those in need.